This part of the Newscoop manual is aimed at editors and journalists working their way through these three steps. 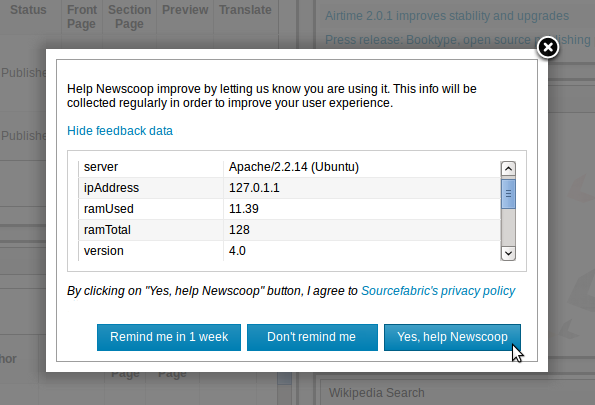 It assumes that the web server you will use is already up and running with Newscoop, and that a theme has been designed for your publication. If you are a system administrator setting up a Newscoop server for production use, you should also read the installation and administration chapters, later in this manual, before you begin work on the server. If you chose to install a sample theme when following the Installation Steps chapter, you can use this theme to learn about Newscoop in advance of having your own theme designed. Theme design is covered in the companion manual The Newscoop 4 Cookbook, available from Sourcefabric. If you have previously logged in using a different Language, your browser will have saved a cookie to remember your preference. If your browser does not allow you to switch languages, you may need to delete this cookie. Please refer to the documentation for your web browser for details of how to do this. In Mozilla Firefox, for example, you can delete cookies by clicking Clear Recent History on the Tools menu.